As usual since work on the 5th and 6th floor addition began, construction-related work within the lower floors of the library has been halted during the its study and exam period, which this semester lasts from April 24 until May 9. In addition, the construction contractor agreed to temporarily remove the plastic sheeting that was covering books on the 2nd floor in the area where the fire suppression (sprinkler) system was being installed. This was accomplished quickly last Thursday afternoon. Workers will replace the plastic when the installation resumes on May 11. Rules laid out in the construction plans specifically prohibit disruptive work onsite during study and exam periods. This effectively means that all construction work within the lower floors of the building is to stop. Jack-hammering, metal cutting, and other disruptive activity within the 5th and 6th floors above is to stop as well. The construction contractor and its subs are allowed to continue work on a short list of other projects above that are said to carry little risk of disruption to students studying on the lower floors. However, these projects can be stopped by Tulane’s department of Capital Projects & Real Estate (CPREG) or its project monitors, VR Management, if needed. There is a separate contractor working in the building on a non-construction related project, a renovation of classroom 308, organized independently by Tulane Technology Services. 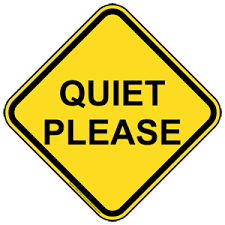 Most of the equipment for the renovation has already been moved up to the room and the remaining work there is not likely to be especially noisy. The work in 308 is expected to be finished by Thursday, April 30, and the new examples of instructional technology taking shape there are impressive. 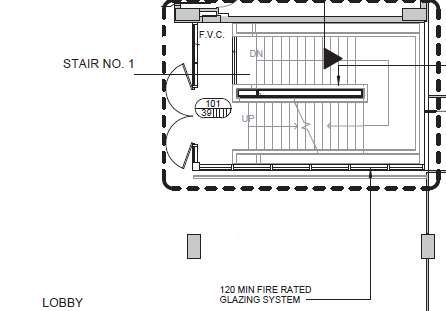 The construction contractor plans to begin this week to build a fire-rated glass enclosure planned around the entrance to the central stairwell on the 1st floor. Some preliminary work began yesterday and workers may begin installing framing for the enclosure's glass panels today--so that the project can be finished or mostly completed before the beginning of the upcoming study and exam period that starts Friday, April 24. During most of the week and a half or so in which the work will take place, use of the stairwell between the 1st and the 2nd floors will be blocked during the day. The contractor has agreed to make provisions to reopen access to the stairwell between those floors for the evenings after each workday and on weekdays when no work is being done. But during the work the area within the stairwell between the 1st and the 2nd floors, and immediately surrounding, will need to be cleared. Alternate stairs to all floors should be available from both the former emergency stairwell on the Freret Street (south) side of the building and the former emergency stairwell on the Dixon Hall side (north) of the building. The building's elevator will be available as well. The large glass panels that will be installed for the enclosure are very large and very heavy. 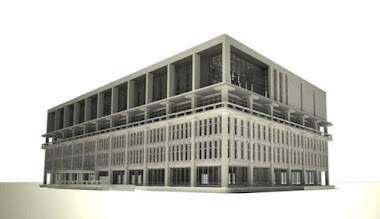 They are considered fire-rated because they are more dense and thicker than, say, the glass panels between the 1st floor lobby and adjacent Quiet Area. In other words, they will be pretty unwieldy. Crews will need to bring the panels in through the former front entrance. The contractor has been reminded to use the correct entrance and exit doors for this and to keep the doors closed otherwise. 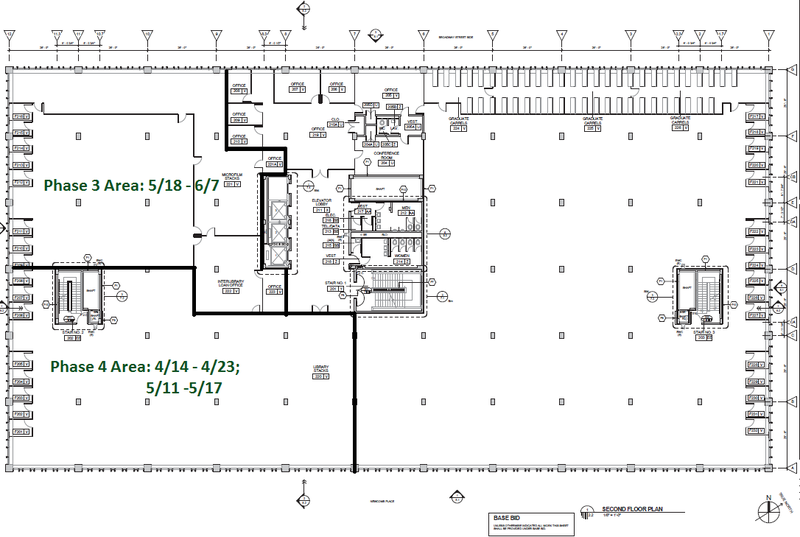 The construction contractor has released a new schedule for the remaining installation of the fire suppression (sprinkler) system on the 2nd floor. Work is expected to begin there next Tuesday. See phases below. The new plan reverses the sequence of the phases outlined in previous schedules so that crews can focus on areas above the books stacks first and then eventually wrap things up in the staffed areas of Microforms & Newspapers and Interlibrary Loan (ILL) later, during the comparatively slower summer session. Area location: southeast quadrant of the building, plus a small area along a wall in the northeast quadrant a directly behind the restrooms on the floor and likely just for a few days near the start of the phase. Area location: southwest quadrant of the building including the staffed areas of Microforms & Newspapers and Interlibrary Loan (ILL), although it’s likely the work in these areas will be done in sequenced portions that would be the last parts in the phase. Once the sprinkler system installation is complete on the 2nd floor, the sprinkler project will be largely finished with only some small areas in the basement remaining, with one of the areas in the library staff lounge. The sprinkler installation on the 1st floor is finally wrapping up today, with Monday allowed for minor touches, clean-up, etc. The sprinkler subcontractor could still be asked to return to area to fix any problems found during later inspections, but this would be minor stuff. The 1st floor work is expected to outwardly appear to be complete by tomorrow.